The year 2013 hasn't provided audiences with many worthwhile comedies thus far. The primary issue is that they simply aren't very memorable. Next year, they will probably be completely forgotten. The majority of them have been light PG-13 entries into the genre, which keeps the fans of the more raunchy material craving for the next picture. Shawn Levy is in the director's chair for 20th Century Fox's next comedy, which is called The Internship. Even though it's a comedy, this film doesn't seem to thrive on laughs. Instead, it focuses on being warm-hearted in the attempt to be inspirational. There are some chuckles to be had here and there, although this shouldn't be judged as a comedy. Audiences won't care about everything The Internship has to say, but it's still an acceptable movie. Two salesmen have lost their careers due to the digital age. Nick (Owen Wilson) and Billy (Vince Vaughn) are trying to simply make enough money to pay for a bed to sleep in. After searching the Internet for jobs, Billy comes across a desirable opportunity. He signs them up for interviews for internships at Google, where they must compete with numerous young, tech-savvy geniuses in order to receive full-time employment. With each challenge getting more difficult, Nick and Billy are forced to quickly learn how to utilize technology if they hope to receive a steady source of income from a job with this incredibly well-known company. With a screenplay written by Vince Vaughn and Jared Stern, this could have been an absolute disaster. Through the first act of the running time, this movie proved my predictions correct. It opens with a lot of painfully unfunny dialogue. It strains itself trying to make its audience laugh. However, the film begins to turn itself around after they're interviewed for the internship positions. Once they arrive at Google, its charm begins to show a little. It still tries to make us laugh, but it actually got a few chuckles out of me. The characters come across as one would expect: cookie-cutter types. Nick and Billy try their hardest to inspire the group of young geniuses to work together in order to win the competition. With a large number of '80s references, they attempt to be as charming as possible. Even though these are one-dimensional characters, moviegoers will somehow find themselves caring about what happens to them. The plot can't possibly get more predictable, although it provides some decent material for those who enjoy this type of film. A lot of The Internship plays off of pop culture references. It runs with jokes involving X-Men, Star Wars, and Harry Potter. However, this film also discusses quite a bit of commentary on the nation's current job market. This movie speaks about how difficult it can be to obtain a job in today's world. Fortunately, this important content doesn't become preachy. However, the picture trails off a little bit with an unnecessary sub-plot. Nick is smitten by an employee at Google, named Dana (Rose Byrne). He continues to follow her and make small talk, which simply makes the feature even more generic. The competition for the full-time positions is much more interesting than the common love story that couldn't possibly be more trite. This portion of the film isn't necessary for its overall objective. The Internship depends a lot upon its main characters. Without a sufficient amount of chemistry, this movie would be an utter waste of time. 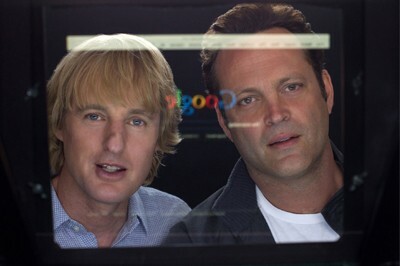 Fortunately, Owen Wilson and Vince Vaughn have strong chemistry as Nick and Billy, respectively. This isn't their first movie together, as they starred in Wedding Crashers together in 2005. The friendship they share is believable enough to carry this picture through its weakest segments. Wilson and Vaughn impress in their delivery. Rose Byrne is solid as Dana, even though her romance with Owen Wilson feels out of place. John Goodman and Will Ferrell have brief cameos, which are welcome additions to the cast. Being filmed at Google's high-tech campus in Mountain View, this motion picture lives and breathes the company. Some audiences may feel that this film can come across as being an advertisement campaign for the search engine's technology. Everything is Google-ized, but I didn't have a problem with it. Each challenge allows moviegoers to see different operations controlled by Google, which is later displayed to a much greater extent through the end credits. The names of the cast and crew appear on screen utilizing a variety of Google programs and applications, which is interesting to watch. The script is the clear culprit for The Internship's biggest flaws. The beginning of the film is horrendous with its severe lack of humor and charm. However, it later turns itself around and becomes quite a bit less robotic. Thanks to the chemistry between stars Owen Wilson and Vince Vaughn, there's a certain charm that allows for the remainder of the film to work. While this isn't a laugh-out-loud comedy or a heartfelt drama, it delivers a few chuckles with some warm-hearted content. This isn't very memorable, although it makes for a satisfying-enough viewing. The Internship is worth applying for once it hits home video. Rent it.